Probably the most uncreative title I’ve ever written for a blog post. But- to use my least favorite sentiment ever- it is what it is. 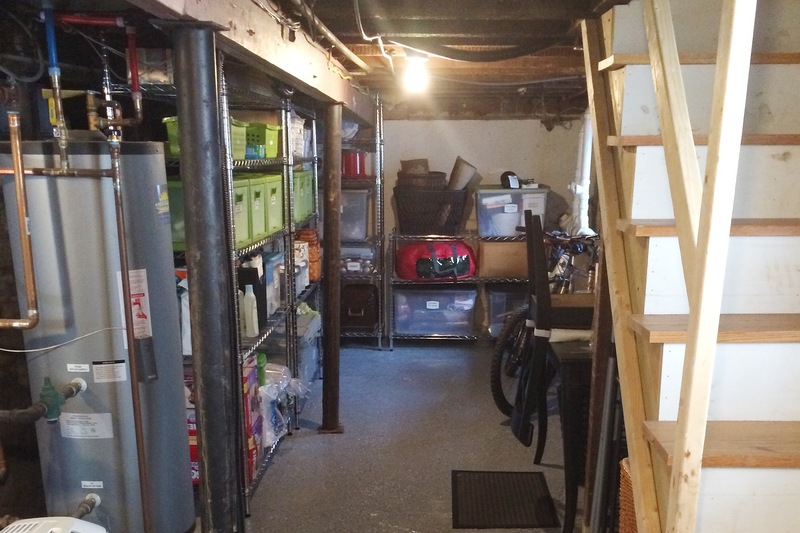 Our basement was one of the last things on our renovation list. There was a disgusting amount of dust and debris pushed through the old subfloors into the depths of the basement. It housed all our tools and paint from the reno once we moved in and it was probably a good home to a fair amount of spiders for a while. We knew we would eventually get it cleaned up. 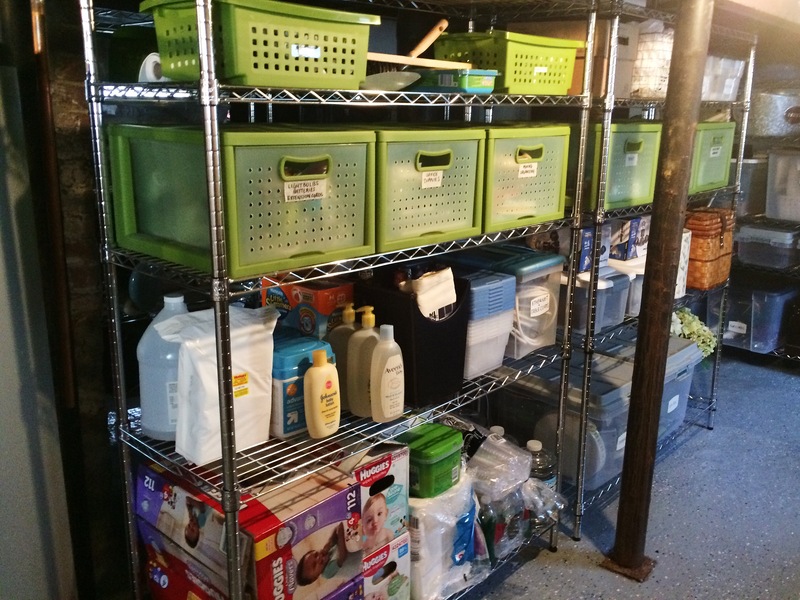 Maybe put a fresh coat of dry lock on the walls, some paint on the floors- but as the baby stuff started to pile up (and then be outgrown so quickly) we knew that storage was not just a wish list item but a must have. As usual, my Dad deserves the majority of the credit for this. He did the backbreaking (and head bonking) work of sweeping, power-washing, painting, etc. But once we had a clean slate, Jared and I spent many a night and nap time, assembling shelving and hauling all our bins and boxes from our guest room down three flights of stairs to the basement. There was also a handful of things left in my parent’s basement that finally came home to ours. So don’t expect a HGTV-worthy reveal. This makeover wins in function not fashion. It’s a huge difference from feeling like you needed to wear work boots to trudge through your disgusting basement before to now moseying down in white socks to grab a roll of paper towels. And speaking of paper towels- woo hoo to bulk shopping again! Holy cow it’s so nice to be able to get the 5,000 pack of baby wipes from Costco and have a place that’s out of sight to store them. 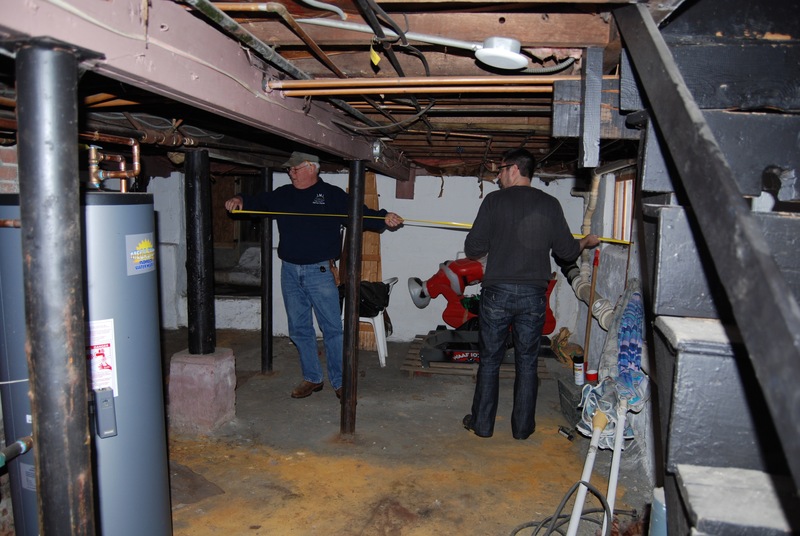 OK, so here’s the basement way back in Spring of 2013 when Dad and Jared were taking measurements for the rennovation before we even moved in. The shelves give us a ton of space! Along this stretch I have all our house bulk items, cleaning supplies, lightbulbs, batteries, entertaining stuff like platters and cake stands. Holiday stuff, crafting, and gift wrap run along the back wall. I even have an old desk down here that got pretty beat up in the move. 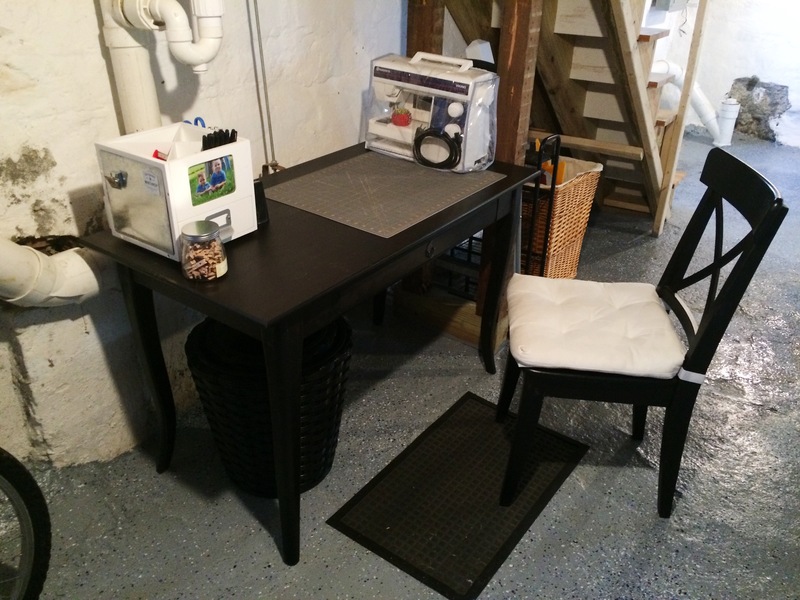 But it totally works as a space to wrap a quick gift or break out the sewing kit to hem a pair of pants. And if you notice the black and yellow post above- that was another genius suggestion by Dad. These lally columns are all over the basement and have nasty rusty schmutz all over them. Some are worse than others but while we were assembling all these shelves, we lost a couple of t-shirts to rubbing up against the rust. A cost-effective solution- rope! We’re really, really happy with the space. 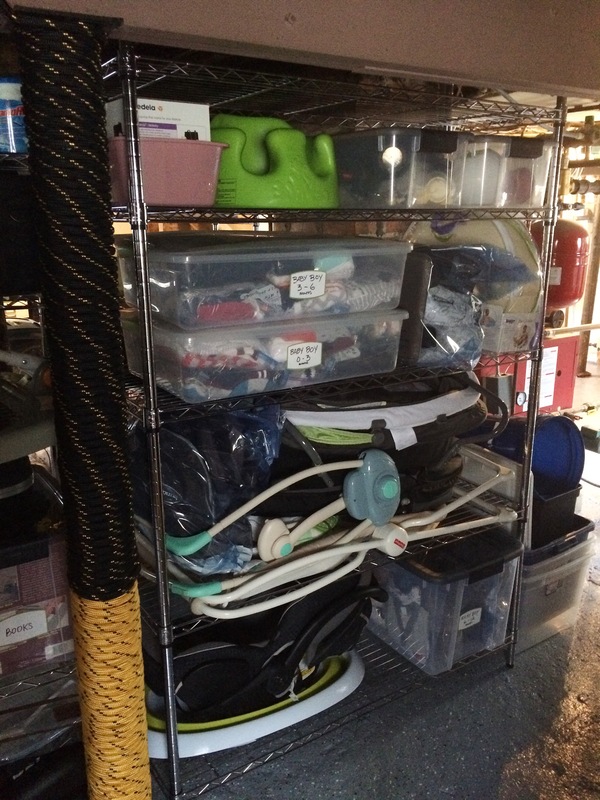 It’s added so much to our everyday lives knowing that we have all of our things properly stored in a clean space and being able to access everything in sans knee high rubber boots! Did I mention a new subpump and dehumidifier are also contributing to our peace of mind? Anywho, I know we’ve had more dramatic and definitely more beautiful room reveals, but to be honest, this is one of my favorites. 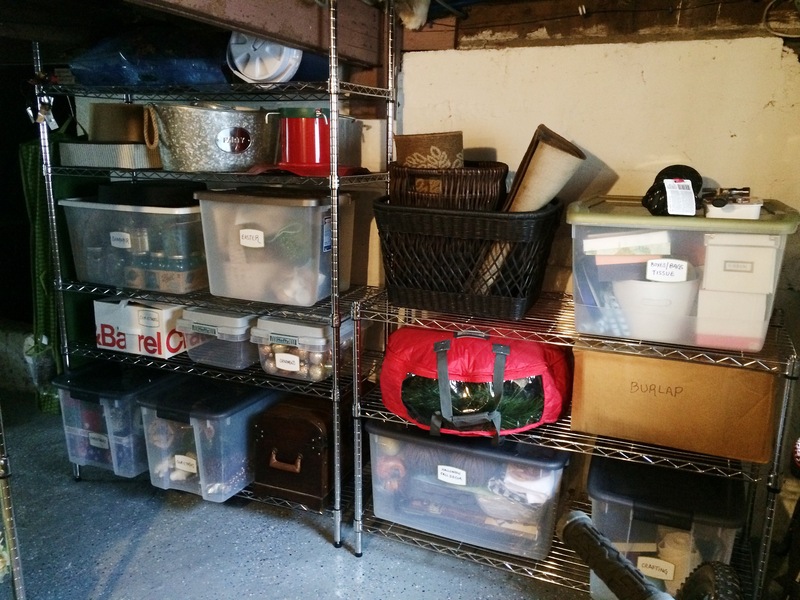 This entry was posted in Decor, Organization and tagged basement organization, organizing, storage solutions. Bookmark the permalink.